New: Update Resources button now also refreshes the image cache. 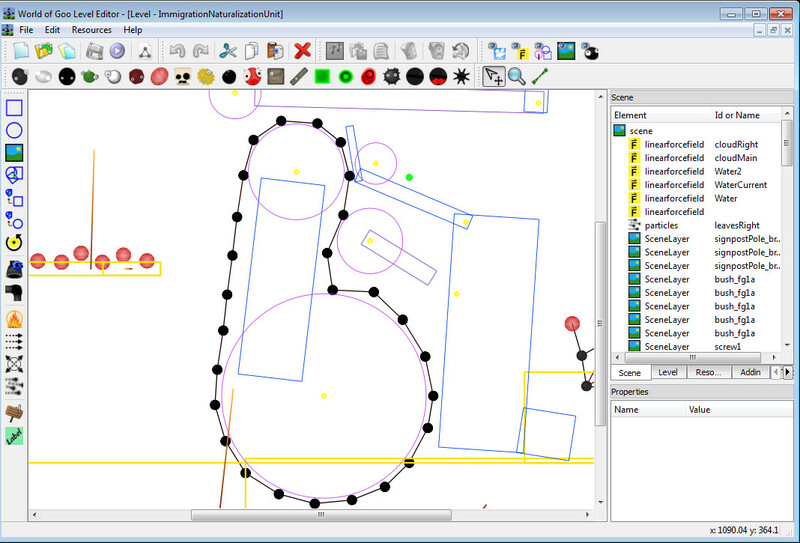 All visual elements can be moved, resized and rotated graphically. Handles TEXT resources for signs and labels, with multi-line text dialog. Full recursive depandacy checking and optional inclusion in goomod files. Many error checks added to prevent WoG crashing when you run the level. To play your levels directly from WoG Editor you need the WoG v1.3 patch. There are 8 current downloads. Show 1 archived download. Daft as Brush: as usual, you exceed awesomeness! EDIT: Be sure to check BOTH the forum version, and the actual version (this one) for new posts on how to improve this. Very goo-d work, btw. I was waiting for this few changes in a progamm. I have a suggestion that I always wanted... how about a function where you can just drag-rotate squares instead of having to type in the angle? Here's something that I reeaaly wanted to add as a feature in WoG Level Master: Being able to grab an image/sound (user-defined) off the hard drive and copying it directly into the WoG folder, giving it a default path and everything. It should also display the custom image as if it were native in WoG. This would be a big help. To confirm, you're talking about adding resources into the Global (Default) Resource lists? So you could import them once, and then they always appear in the Auto-Complete box, so you can use them in multiple levels without having to add them to the resource file for each. Or make copies in each level folder. Sure, any importing would only accept png or ogg files. Re: Music Change - Looks like it's "hard-coded" into the exe. I can't see anything in the XML's that might cause it. I'm so excited! Thanks for the effort, DaB! I can't wait to try out the new version at home! EDIT: Now that I've made a level with it, I can tell you a few (hundred ) changes I'd like to see. Not all of these are short-term needs, but eventually, it'd be nice if these changes happened sometime. 1. You mentioned "Other special ball cases" in the forum topic. Anchors, AnchorFriendlies, AnchorStickies, and AnchorStickyInvisibles should always be gb1 on a strand, because as far as I know, they don't have strands defined. 2.New strand mode is nice, make sure dragging from the middle of one ball to the middle of another works-only edge-to-edge now--and drawing the strand while you're creating it would be great. 3.pipe verts maybe should auto-snap to be 90-degree angles - I don't think WOG likes anything other than 90-degree angle pipes. 5.auto-material (maybe rock) for geometries to avoid crashing. Alternately, you could highlight this field red to tell people that they need to type something in there. 6.Prevent static geometries from having a mass. It doesn't crash anything, but it's pretty redundant. 7.Pop-up text boxes with names now waaaaay to narrow-can't read a thing. They were ok in wogeditor 0.5, but now too small. 8.how about not having to double-click on boxes to enter stuff?? 9.Sizing rectangles-a drag handle on each corner would make it easier to use. Also, for rotating rectangles, you really only need one rotation point. Maybe you could leave all four rotation points on all four sides(like it was originally), and have a drag handle on each corner. Also, the rectangle should rotate around its center. Double-check the code around there. 10.Sizing rectangles-sized rectangle image is drawn scaled, rather than sized, as you're dragging it. Ok if you leave it, but minor glitch. 11.Undo feature-it would be hard to make, but REALLY useful. EDIT: I see some support for an undo feature in the source code; are you working on this already? 14.force fields-don't always get selected like they should. Also, drag handles on their corners would be nice. 15. Selection method--You should have to click on a geometry (scenelayer, etc) before you can move it. By default, the selected object should move. I say this because I kept accidentally dragging the background image around when I was trying to move rectangles around. 16.Some kind of visual distinction between types of Goo Balls? If only use the ball's body image, would still be great. This would be a long-term type of change I'd like to see. 17.xml it outputs is pathetically messy; hard to do any after-levelmaking editing. Add indentations and newlines? 19.Geometry images should have correct depth. You probably already thought of this, though. 20.Empty the right pane when the corresponding level is closed. Also, if you open ano original WOG level, close it, and open one of your own, it gives you an annoying message saying it can't make changes to original WOG levels. But you're not. These two problems are probably closely related. 22.Being able to drag/scale/rotate an image for a geometry would be great, too. You probably already thought of this, but I'm just making sure! 23. It should save in some data file somewhere if it was last maximized or not--so it'll start maximized for me. It's a minor annoyance for me having to maximize it every time I open it. It starts nearly full-screen, but not maximized. 24.level child windows should start maximized, as well, as long as there aren't any others open. 25. My idea for Force Fields--drag the outer point thingee of the force field to set force, and direction. Shows force in small pop-up tooltip, and rounds to nearest whole number. Ask me if my explaination doesn't make any sense. That's all I can think of for now! Keep up the great work! By the way, if you close the command-line window instead of the editor window, it doesn't give you a crash message. Heh, heh. Hmm... That's quite a list! Might take some time... will tomorrow be OK? 5 is a good idea, although I've not seen a crash from having no material. 9,14,19,22,25 - Anything involving multiple-visual elements Geom w/Image, Forcefields etc will take a while, because the original code is NOT GOOD for them and will require some "restructuring"
11 - Undo - looks like there are crumbs left by zark. There's loads of stuff like that.. comments like "ToDo" or "Fix" or "Maybe Later.."
But I am looking at letting you "Freeze" or "Lock" elements, so once they are positioned right, you can't move them by accident. Most of the rest I'll put on the "Wish List"... unless I happen to stumble on a quick and easy way to do them! Thanks for the input... ... keep it coming! Seriously, if you can make all these changes by tomorrow, I'd be completely amazed. I think, that selecting level elements should be not connected with MOVE mode (like in old versions). Now often you can select and move item that you don't want (there is no UNDO option). New strand-adding system is very good idea. Seriously? I thought that integrating the Move and Select modes together was a really good idea. It just has a few kinks that still need to be worked out. Locking a particular item in place would work (maybe that way, you could only select it by the pane on the right, it would save time trying to select the correct object). The only problem would be saving what is locked and what isn't, or would these be temporary changes that go away after you exit WOG Editor? Whatever you do, it's still better than editing the xml by hand! THEN Press and Drag to move. Saving what is locked (or anything else like that).... is NOT a problem at all.. That's one of the nice things about XML. If I add EXTRA attributes to anything, WOG Editor will allow you to edit them and then save the values in the level files. So they will be loaded in next time... AND... the game will just ignore the extra info. how about selecting with the left and moving with the right mouse click? So easy camera angles are out of the question? I thought about using Right button, but I'm trying to save it for doing Pop Up menus of "useful" stuff.. based on which item you clicked on. I guess you mean setting the camera endpos and poi's... "angles" aren't involved. Certainly not "Out of the question" but low-priority, since they aren't essential / important for making a playable level. Integration of moveing and selecting is good when we talk about ballinstances. In level is lot of Goo balls, and when you were moveing and selecting they in old way it wasn't very funny. Probably there we need Scene and Level modes? 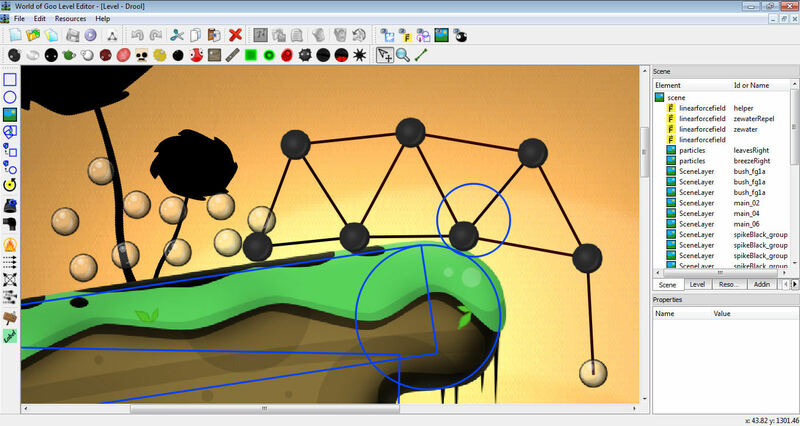 In scene mode I can't move Goo Balls, but in Level mode it's impossible to change a position of graphics and shapes. But I saw, taht this version not shows me a position of mouse all the time. But in strand mode (in all modes, but only in strand mode it works correctly) it shows (refreshs) the position when button is pressed. Now I don't have to white coordinates on paper before set camera position or scene edges! Well, this would only partially solve the problem, since I keep trying to move a rectangle and instead move the background image, and both are in the scene.xml.bin file. Wouldn't locking something in place still work slightly better? Eventually, DaB, it would be cool to have rectangles that show camera poi's, and you can drag them around and scale them without having to type hardly anything. I realize, however, that this may take some time. Already, though, it's coming along! Yeah! Those are really good ideas! Number two would sure beat right-clicking and choosing from a pop-up menu. And number 1 would be useful, as well! Read the version.txt file for full details on all the changes... there's quite a lot! Pavke and I are certainly thinking the same things... see the new toolbar! Nitrozark put in a few bits of code and comments for Multiple Selections... but it looks like he did get very far. I think it works well, and it leaves Multiple Selections and Right-Click Context menus open. I just downloaded 0.6 and it's awesome! I really like strand mode, it's like a connect the dots game. DaB, when did you add simple buttons? If you add it before i mentioned it then we really do think a like! Clone a Level - Save the new level - close Wog Editor - Restart WoG Editor - Load the new level... and everything is fine. I've thought of a new way to make it work (different to how it doesn't work now) I'll probably put that in the next version, if I can't fix it. @Pavke - Added the toolbar days ago!.. Scary! Sweet! Just looking at the version.txt file makes me wish I was at home to try the new changes! A bug I noticed in the old version (0.5): the images in scenelayers don't automatically update when you switch them out for another image. A bug I noticed in the new version (0.6.2): I added three pipe vertices to a pipe, moved them to the locations I wanted, but later decided to delete one. However, WOG Editor still drew the black line (but not the purple pipe vertex). I dunno if you've fixed either of these in 0.6.3, but they should go on your "Eventually need to do" list. They're only minor inconveniences, though! PS. thanks for spending the time to fix this, its AMAZING! hey how do you change what the signposts read?? It does support them, although it took me a lot of trial and error (mostly error) to get py2exe to include it correctly. I've used the gooball as you suggested, but if you can make a better icon.. go for it! Then they'll appear in WoG Editor and you can select them for the signpost. I'm looking into ways WoG Editor might be able to simplfy that process, it appears Nitrozark was thinking the same.. although it might be quite tough to do.. so don't hold your breath! for the new, easier goomod 1.1 format way to do this. I decided to test GeneticSortingMachine to see if your suspicions were correct about the music change being hard-coded into the XML. I cloned the GeneticSortingMachine level, renaming the new level "xmlTester." After saving, exiting, and coming back, all the images were displayed in WOG Editor. 1. Imagine my surprise when I hit "Save and Play Level" and the game showed no images whatsoever, with no music! Oops! I double-checked, and found that WOG Editor had placed my level in a folder named xmltester, while in the resource tab, my scene was still named scene_xmlTester (Capital "T" on "Tester" like I had typed while cloning the level). This might be something you want to check on! By the way, I think you're correct. In my clone of GeneticSortingMachine, temp_DWtD1 kept playing the whole time, even after I busted the Beauty. Nothing major; the ball still is added ok. I think you might just be doing something slightly against standard Python syntax or structure without knowing it. Double-check your code. .ogg files are placed into res\levels\[level name]. As thB has noticed, Soultaker's volume control doesn't work unless the song is in res\music. You might want to change this. 4. Another thing: When I added a rectangle (the easy way) it told me it has to have an image with it. This warning persists, even if WOG Editor is closed and reopened. Also, this causes WOG to crash when it tries to play the level. Oops. I've tried to get the problem to reemerge, but I only had it happen once. 5. Yet another problem: When a rectangle is added into a compositegeom, it has static=true and material=rock, no matter what attributes the compositegeom has. Here's a suggestion: if the compositegeom has static=false, make the rectangle have a default mass of something like 100. Otherwise, the rectangle should have the static attribute empty. On top of this, the rectangle should never have a material if it's inside a compositegeom, even if it's the same material as the compositegeom has. It's kinda redundant. The same holds true for circles. Sorry I misled you into this mistake by asking for default rectangle settings. 6. When a rectangle is added "the easy way," it has the same name as the last rectangle added "the easy way." double-check on this. 7. Minor inconvenience: Ideally, when you copy and paste something, the new object shouldn't be in the exact same location as the original. It should be offset slightly, and successive pastes should be offset more each time so you can see all that's there. 8. Minor inconvenience 2: It seems that Goo Balls with strands are harder to select and move. Anyway, I must admit, your new features for this program ROCK! This makes it about a zillion times easier to make a level! Woohoo! Rock on! Why, when I use button to add rectangle, WoG Editor wants to set image for it? this may sound a little dumb, but the strand mode isn't working. AND IT DOESN'T CONNECT A STRAND!!!!!!!!!!!!! 1. Make copying maps save the images by either updating the Directories automatically or by copying the files to a new area. 2. Add a browsing function when adding images so that copying and pasting hundreds of directories isn't necessary. 3. Add a grid locking system for moving images and geometry. Fixes most of the bugs mentioned above... and tweaks few things. #1) It tried exactly what you said, and it worked fine! The only way I can see to make that happen is to Clone the level as xmltester, but not save it. then clone the level again.. this time as xmlTester. Did you maybe do that? #2) It's not "ERRORS" or syntax / code problems, it's just a bit of Debug Output that I left in by mistake... don't pay any attention it. #7) That was MY idea damn it! Posted in Enchanter's thread. Doesn't look easy to do, but it's on the list! Could you check and get back to me? #1) I don't see the need... always making copies of existing graphics is just "wasteful". - You can use any graphics from any WoG level without copying them into your level folder. #2) "copy / pasting hundreds of directories" Huh? #3) I'll put it on the list. Cheers! This thing DOES have more "Encounters of problems" than the other one did. If I take the original source files from Nitrozark and compile them.. I get the same thing. I don't know why! I can only think it's something to do with he used Python 2.5.x, and I'm using 2.6.x and I think the versions of the QT libraries are also a bit different. All things being equal, you'd expect something compiled from the 0.5 source to perform exactly the same as his 0.5 exe, but it doesn't. Which is odd! I do have a couple of suspicions as to what might be causing it, but they'll take time to investigate (remember I only have about 40hrs total python experience). But if they don't pan out.. the problem could be anywhere! Resource paths should be forced to always and only use the / character as path separator. 1. What I actually meant was a not that it would make a new resource as I know that that would be wasteful but more that it would copy the image file to the right folder so that it could be used in the game (still not sure im making scene but never-mind). 2. As in a browse feature so that you can select the image in the editor with out finding the image in windows explorer, copying the image URL and pasting it into the "path" text field. Ahh...I see... well that's already done! There's a new button on the main toolbar "Import Resources" which gives you a standard Windows File Open Dialog. You can select one or multiple files. It starts showing World of Goo/res but you can browse off anywhere you like to select images(png) and it will automatically copy them into the level folder (if they're not already under the Wog/res folder) as well as add them as Resources for this level. Give it a try! By the sounds of it you'll be pleasantly surprised. I start the editor and it is all running good, till I get to the playing. After I test the level when it starts up I cant pan up and down or up. Click the Scene tab (top right panel) then click the top (root) item.."scene"
Click The Level tab, and again click the top (root) item... "level"
if it's "true" then WoG limits the camera to areas which have been "explored". if it's "false" then the camera is free to move anywhere in the level right from the start. #7) That was MY idea ---- it! Posted in Enchanter's thread. Doesn't look easy to do, but it's on the list! 1. Yep. I might have done that. Oops. Sorry. 7. Sorry, I didn't notice! Anyway, keep up the great work! Looking forward to trying the new version! GooMaster2000: Also make sure that the background image doesn't have depth = 0. If it does, the strands could be connecting, but you just can't see them. Can you make the coordinates have only 2 digits after , when stuff is placed by hand? I think that edges of scene should be visible. You are really getting in to python DaB, that great! How easy it so learn it? Any similarities with c++,java? I like last two updates in 0.65v nice feature! about small but critical change, what is it? So that we can keep an eye out. Well, I'm a bit behind, but no complaints with version 0.6.4. Keep up the great work! Pavke: I was looking at the code, and it kinda looks like C++ to me, but I'm not a hugely experienced programmer. It has "similarities" with a load of other languages I've used C(++), java, Basic... subclassing plays a large part in the original source. There's a couple of fundamental differences too, like Whitespace / Indents matter! Took me a little while to figure that out. Perhaps I should have taken Python 101 before diving in. All-in-all though it's not too hard... especially if you've got someone else code to follow / copy / modify.. and a good IDE which highlights syntax errors for you. So far the biggest nightmare has been that the PyQT documentation is about 1,000,000 htm files... and doesn't have a search tool (although Google does OK with the online version). I've changed 1 line, which has altered the "route" that a value entered / selected in a Property box takes to get stored in the attribute in the level data. ii) the value changes but the displayed item doesn't seem to change at all, or doesn't change correctly. So I copied it form FM. In my level it was without an image, and editor was showing an error because I didn't load lever image. After I load it, editor name it as original .png, something like "IMAGE_SCENE_FLYINGMACHINE_ORIGINAL.PNG" witch was different the the rectangle image name in scene tab form the original FM, something like "IMAGE_SCENE_FLYINGMACHINE_LEVER1"
As much as I tried editor wouldn't accept renaming it to ..._ORIGINAL.PNG and I didn't get the image for the lever. Is that it or m I doing something wrong?